The Finished Product. 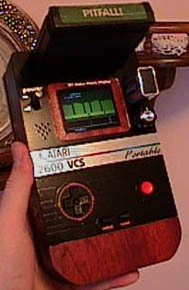 The Atari 2600 VCSp. It all started one day while I was at work . . . I’m a graphic artist and I use computers everyday, and of course they sometimes (quite often) don’t work right so I end up on the phone with tech support. So there I was, listening to Musak, sitting in my chair, waiting, waiting… My mind drifted away… to Atari. The Atari 2600 could only display a background, 2 players and a ball at the same time. So, think of the 2 tanks in Combat, those are the 2 players. And the gunshot is the ball. If you wanted more players, you could take 1 player and flicker it back and forth quickly, to make it look like 2. (It’s called multiplexing, and they did that A LOT on the Nintendo). But that looks crappy. And some Atari 2600 developers refused to use it. Luckily for the 2600, it had a thing called H-Strobe. I can’t recall if it was a glitch or something actually designed into the 2600, but, at any rate, it allowed a player to be duplicated up to 3 times, in a horizontal fashion. Without H-Strobe, and then WITH H-Strobe. I bet a lot of you are thinking “So what?” Well, the thing is, when you have 2 players being multiplied 3 times each, you can have up to 6 players across. And each player can be as tall as the screen, so you can multiply them that way as well. Are you STILL thinking “So what?” Well, recognize this???? I believe Jimmy Carter said it best – “A chicken in every pot, an Atari hooked up to every TV.” And maybe he didn’t that say… but he should have! Ok, so I got off-subject. Well, not really. I have to show my passion for Atari, don’t I? Well, anyway! Tech support came back on and I was snapped back into work. But the idea was in my head! I am ashamed to say this, but, it must be said. At the time (February 2000), I did not own an Atari 2600. Probably because I have a 7800, and it will play all the same games, but still, is that any excuse? And those 7800 controllers, UGH! Which monkey designed those, and when will he be sent back to the zoo? Besides, I knew for a fact that the 7800 had a lot more chips and things that I would have to figure out, so I didn’t want to tackle that. Also, the 7800’s are somewhat hard to find, so I didn’t want to rip mine apart. Also, I wanted the portable Atari to be pure. A pure, 100%, older-than-dirt vintage Atari 2600 unit, with wood grain and everything! A friend of mine had one that he (gasp!) was not using. We pulled it out of storage and I began my task! Well, I unscrewed the thing, pulled it apart, and looked inside. 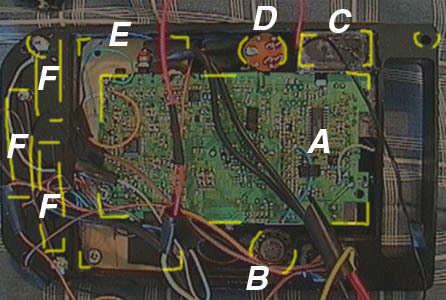 A circuit board, with 4 switches mounted on top, a cartridge hole, a big capacitor, and the rest was covered with metal armor plating. All in all, the circuit board was about 10 inches wide by 6 inches tall. Small, yes, but too big for a portable unit. I used my manly Herculean force to rip the metal shielding off the circuit board. Underneath, I found the 3 Sacred Chips, and a whole mess of resistors and capacitors. Ok, sure, it could be done. But, I’m not really a circuit board making expert. So, I went to sleep that night in despair. The circuit board sat there, mocking me. And then it hit me. Wasted space! I grabbed the board. “Hey! Let me go, you fiend!” it cried from the depths of its silicon soul. on hearts, they can do it on Ataris! Anyway, I was interested in composite video out for 2 reasons. One, it would give a better picture. Two, if I could get a video signal from the chip itself, then I could do away with the RF modulator! An RF modulator is the thing inside the Atari that makes a TV signal. It takes the video signal from the chips and makes it into a Channel 2 or 3 signal that any old piece of crap TV can pick up. It’s the way everyone hooked up their Atari, because it was the ONLY way. Besides, I highly doubt that the crap-ola Zenith TV’s circa 1981 had composite video inputs. But they might have, heck they had laserdiscs back then! A power wire of some sort had to be jumped because of this amputation. Also, the RESET and SELECT switches had to re-wired, since they (originally) were on the section that was hacked off. However, they were simple! Each switch, RESET and SELECT, used a pin off the RIOT chip, and went to ground. YAWN! Here are the portions that were sawed off the original board. The silver square things on the right hand side were where the RESET and SELECT switches were. The silver thing in the lower-right hand corner is the RF modulator. I found some article off the Internet (where else?) that explained how to get composite video off your Atari. They called it a ‘bare-bones’ approach. Well, I tended to agree, because it only partially worked! Before I explain how I got it working CORRECTLY, a little history. There are 3 chips inside the Atari 2600. * The 6507 Processor. This blazing chip could reach speeds of 1.19 MHZ. (I’m not sure what it could do over clocked, maybe run Half Life, who knows?). The 6507 chip is quite similar to the 6502. The 6502, as you might recall, was used in everything from the Nintendo 8-bit, to the Apple II, to the Atari 400/800 line, to the Atomic Bomb, and even, in an altered form, to the Turbo Graphix-16. Yes, that chip got around, alright. * The RIOT Chip. This chip did stuff like look at joystick ports, switches, I/O crap, and stuff of that nature. If you refer back to the last page, I mentioned wiring the SELECT and RESET button directly to it. Now you know why! Also, the RIOT contained the Atari 2600’s RAM. A whole 128 BYTES! * The Stella Chip. This is the chip that did all the graphics of the Atari 2600. It was called Stella, also the code-name of the system. “Stella” was the name of an Atari employee’s bicycle. Hey, it was the 70’s, alright? Ok! So, according to this web site I found, if a person hooked a lead to pins 2, 5, 7 & 8 of the Stella chip, they got LUMA output. And, by hooking a lead up to a certain resistor, they got CHROMA. And by hooking the LUMA and CHROMA together, you get COMPOSITE. And with COMPOSITE, you could hook that to a VIDEO IN on a VCR or TV and get a nice, clean signal! My intention was to use a portable TV unit as the screen for the Atari, and the portable TV’s usually have VIDEO IN, so, that’s what I wanted to use. I scoured the Internet some more, and found another method of getting video off the Atari. This method involved a complex circuit, involving resistors and things. But it still hooked up to the same pins on the Stella chip. potentiometers, I was able to adjust how much signal came off each wire. attached the potentiometers right to it! If I ever needed to adjust the signal, I could. The TV I used. 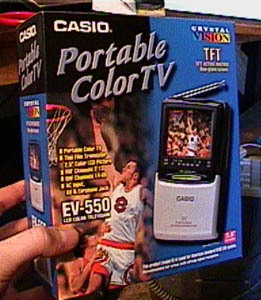 It’s a Casio EV-550. The screen is a 2.5 inch TFT (thin filament transistor) active matrix, which means moving images don’t ‘smear’ like they did on old laptops or the original Gameboy. The EV-550 can tune in TV stations, but I didn’t think that was a feature my Atari needed. All I needed was the video input so I could get the signals from the Atari. As for the case, I tossed that as well and only kept the screen, speaker and the circuit board. It was a far, far better thing it did than it had ever done. Sound was easy. 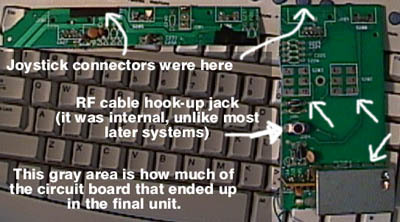 It involved hooking one lead up to the junction of a resistor and a capacitor, then attaching the other lead to ground. The rear half of the unit. The unit was done in 2 halves. 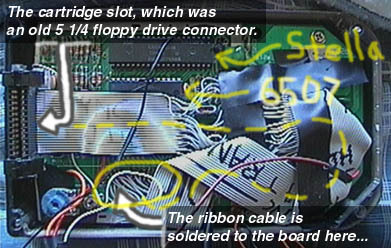 The rear half contains nothing but the circuit board and the cartridge slot connector. There might be some electric tape back there, too. Early on I realized that the cartridge would have to stick straight up. It saved room, since it sat on TOP of the circuit board, and not beside it, on the same level (like a Gameboy). Had I made the cartridge slot like the Gameboy, it would have made the length of the unit about 4 inches longer at the top! Besides, sticking straight up is 1): a sun-screen 2): more like the original Atari. 3): different! As you can see by the above picture, the circuit board and case was about as small as it was going to get! The blue thing in the lower left corner is one of the potimeters that I used to adjust the video. (see a few pages back). It took about one zillion years to solder the ribbon cable between the circuit board and the new cartridge slot, but it allowed me to put the cartridge slot wherever I wanted. Now for the Front Half of the case! 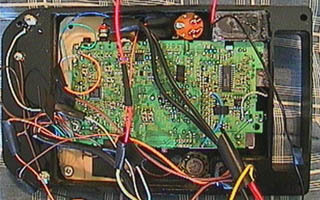 A): The circuit board of the portable television. The portion near the ‘A’ has the screen, so it’s the thickest. To the left is just circuit board, since that’s where the batteries were on the original pocket TV. This space allowed me to place the Control Pad Circuit Board (E) right on top on it. (well, it appears BELOW it here). In the lower left corner of the TV circuit board you can just make out a screw that attaches to control circuit board, holding the TV circuit in place. C): The place where the 9 volt hooks up. It had to be tough to with stain the insertion force! D): The volume control knob. It’s an off-the shelf model from Radio Shack. The silver colored knob also came from Radio Shack. It looked the most vintage 1970’s of all the knobs they had. F): This thick section of the case holds the batteries. I crudely drew where they are. If you look back a few pages, you can see them from the front. It’s hard to explain kinda. The best analogy would be that it was like designing a level for Doom, where it seems 3-D, but you’re really only making a 2-D map. Or maybe… Ever see one of those pin-things, where a zillion pins are under glass, and you can put your hand against it to make a shape? Well, it’s like that. Everything has a position and depth, but that’s it. Course, I reckon most molds and castings are kinda like that. Well, that’s about it for the story behind the making of the Atari 2600 VCSp. Thanks for coming along for the ride! Pingback: At Gizmodo Gallery: The Full List of Wonderful Stuff | Gadgetorium!